Somerton & Frome is a constituency located in Somerset in the south west of England. The seat was created in 1983. The current member of parliament is the Liberal Democrat’s David Heath who has represented the constituents since 1997. I am a local “boy” growing up in Frome and spending 35 years living in Somerset. My family all live locally and I think the way to remain in touch is to spend time with real people identifying real issues. Not in London but here in Somerset, not in an office but out in towns and villages talking to real people. Following on from the first question as an independent I have no political party telling me what I must or must not do. 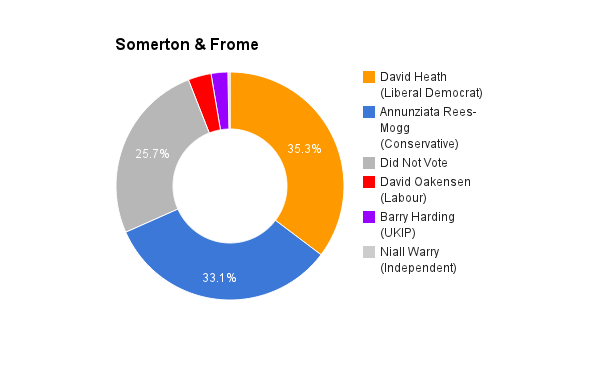 That’s down to the electorate of Somerton and Frome. It means I get more time with the people that matter – the constituents of Somerton and Frome. Additionally it appears as if we are heading towards a hung parliament. The only way to pretty much guarantee the Somerton and Frome MP is in government is to vote for an independent – after all who are the parties going to choose to work with to gain power? I believe that David has done his best to represent the best interests of the people of Somerset. I believe he has been a strong advocate of the dual carriageway of the A303 and he has obviously made connections within the constituency to continue getting re-elected. Ask 100 people get 100 different answers on whether austerity is working. To give an politicians answer I do think we need to balance the books and it should be done by the generation that has caused it not leave it for another 20 years for our children to sort out. Me personally I do not feel any better/worse off than when the last government where in power. I do not believe in the blame game, so for me it’s not what has happened in the past, learn the lessons then move on. The lesson is that some things have worked and some things haven’t. What we need to do is more of the right things to bring down spending but not at the cost of those that need it. This and many other countries have been founded on immigration, however I think we need to identify why people are coming to the UK. I believe we need to be more sympathetic to those that come here because they want something more than their own country can deliver (after all that’s why people leave the UK). But equally we shouldn’t be the place to come to get free handouts. A large number of people do come to the UK and do the jobs that most other people don’t want to do, so without immigration do we end up stifling opportunities for growth? Plus how many of those immigrants then go on to set up successful business which employ more people and generate more money going back into the local economy. Make Somerset an area where people desire to visit, spend time and spend money. By attracting more visitors to the area we create opportunities for business growth and new business’s. By creating new types of employment we can increase skills and training giving greater job satisfaction. Keeping and raising skill levels means higher wages which means more money comes back into the local economy benefiting many by raising living standards and allowing people to gain a wage that may allow them to buy their own home. I believe that we have fundamental flaws in our healthcare system. Part of that can be blamed on a lack of staff, part on lack funding but we need to look at the big picture. Take a hard look at the NHS and then redesign it for the future. We seem to want something that was created 70 years ago to work exactly the same way now. I have a large number of friends who are either still practising or who have had enough with the ’system’. But even those still in it are frustrated with a system that doesn’t seem to do its job and it’s not just a lack of money or staff. The NHS needs changing and updating but it almost needs to be stripped back to the bare bones and then rebuilt from the bottom up. More job opportunities for those living in Frome, Somerton, Wincanton and the surrounding areas 1) to help those unemployed get work reducing the dependency on benefits or worse resorting to crime in order to live. 2) More jobs mean more opportunities for higher wages, greater job satisfaction or increased skills and training, without having to move away from the area. How to achieve this 1) Make sure that we fully understand the needs of employers in the towns and villages helping to give the workforce the skills and tools necessary to fulfil those needs 2) Help people currently not in employment, education and training to find suitable jobs by working together as a community. 3) Introduce Business incentives and/or local grants, Promote the new accessibility that A303 will bring once dual carriageway is complete to attract new employers. 4) Work with existing business to help them grow either locally or nationally through forged business links. I’m what would be considered a middle class married man with a step child, living in rented accommodation, running a small business, none of my immediate family have university education ( I managed to go to Nursing college based on GCSE results not A levels otherwise I wouldn’t have had higher education). How many people like me do you see in Parliament? I think this is why so many people have switched off from politics as all they see is people in suits out for their own ends not here for the people. So yes it lacks diversity. Firstly it would not be up to me to tell my constituents how to vote, after all I am pushing independent thinking. I would like to see a vote because I believe that most people would vote to stay in the EU rather than opt out. Yes it has it’s disadvantages, but overall it offers more than it takes. Freedom of movement, laws that do actually benefit individual people and organisations that we wouldn’t have otherwise, and the financial benefit of dealing with our European neighbours (worth some £400 billion) are just some of the reasons why I feel we should stay in. I would love the opportunity to tell my constituents both the positives and the negatives of continued membership of EU but ultimately I would never tell them how to vote.